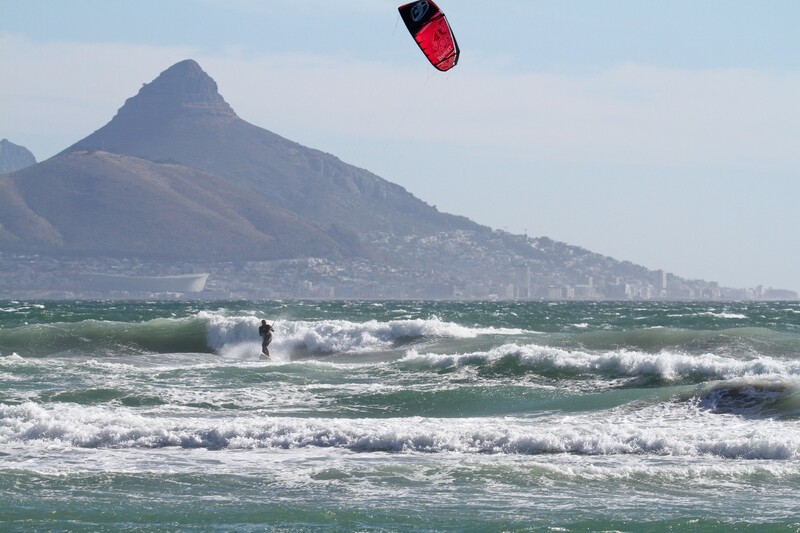 Frequented by some of the planets top kitesurfers and home to the scintillating Red Bull King of the Air, Blouberg in Cape Town cannot fail to express through action just what an incredible place it is. It is infamous for its strong & reliable wind from December through to February. The shoulder months of November and March are often also excellent; some may consider them better than the primary season due to a lower number of people on the water. The wind blows around five days per week between 20 – 40 knots characteristically kicking in lightly around 10 am and building consistently throughout the day until by 4 pm when its indeed blowing its socks off. There is a multitude of beaches to ride on along the 10-15km long stretch of coastline which runs from South to North begins at Sunset Beach and continues to Big Bay or even further for the more adventurous. These collections of sandy beaches make for some seriously good downwinder opportunities. 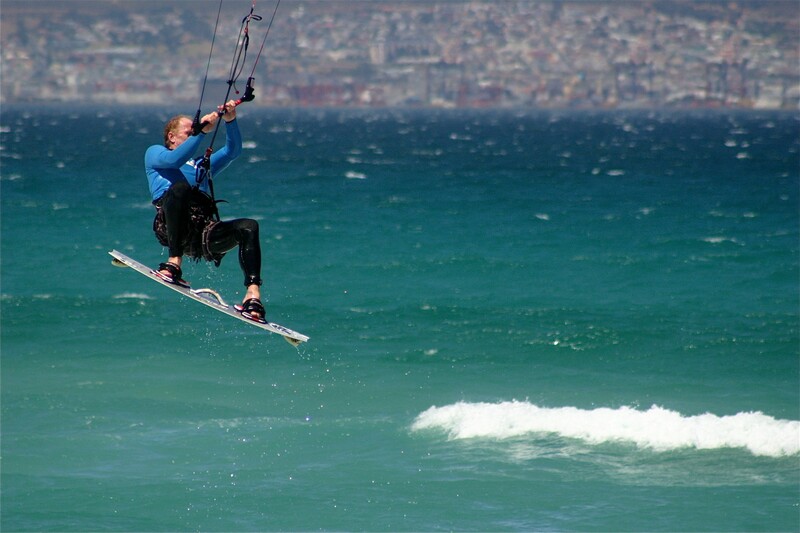 If kitesurfing is not the only thing on the agenda, then Cape Town and its surrounding area could not have more to offer for the outdoor enthusiasts through the more sedate thrills for those who don’t consider themselves to be an adrenalin junkie. Spectacular scenery, unique coffee culture or awe-inspiring vineyards name just a few of the highlights. The climate here is immense. The day time temperature is in its high and dry 20’ to early ’30s, perfect for boardies, bikini’s and flip flops while in the evening it can cool down in the breeze and you might need a pair of jeans or a hoody. It makes for a good nights sleep as temperatures at night are cool and pleasant. The other thing to note is the sun is very strong, so a strong suncream is essential. The water temperature is cool and refreshing, so bring a 4 or 5mm wetsuit. You can avoid hiring a car in Cape Town if you choose accommodation wisely on the beachfront in Big Bay or Blouberg, but hiring a car is highly recommended because there is just so much to see, do and ride during your stay. The boardwalk at Big Bay! There are a huge range of cafes and restaurants throughout Big Bay, Blouberg and Capetown where you can choose any dish you wish from fast food pizza or Nando’s through to top quality locally caught fish and seafood and mouth-watering steaks of beef, springbok, kudu and ostrich. Some good restaurants to try are Carne in Capetown fora great steak, Paranga in Camps Bay for great seafood, Black Sheep on Kloof St for a variety of South African dishes & Primi Piatti in Table view where there is something for everyone. Further top tips are head to Melissas in Table view for breakfast and Carlucci's in Blouberg for lunch. Blouberg and its surrounding area are just immense. Some no wind time is essential. The area is outstandingly beautiful. Choose between cliff top drives along Chapman's peak to Cape point, up-close experiences with baboons, mountain biking in Stellanbosch, climbing/hiking up Table Mountain, vibrant markets such as The Old Biscuit Mill open on Saturday mornings in Capetown or Bay Harbour Market in Hout Bay. Don’t forget the green and mountainous wine regions of Franschhoek and Stellnbosch, plus there is always a party to be found as the sun goes down. Jo Wilson runs coaching clinics here every winter. The only downside to Capetown is its surprisingly poor Internet. Many of the accommodation options do not come with Wi-Fi, but there are plenty of cool cafes to head to such as Carluccio's in Blouberg to get your online hit. No matter where you go the Internet is pretty slow. There is a multitude of places from 5 bedroom self-catering houses which you can find on gumtree or other online accommodation guides such as capestay.co.za through to various budget hostels such as that on capetownguru.com or the more luxurious hostel of capetownkiteclub.com. Prices range from £10 per night in a hostel up to £200 per night for a good quality 4/5 bedroom house. South Africa is well known for crime, but this is often considered by people who have not yet been to Cape Town as worse then it is. You need to keep your common sense about you as you would in any major city, but once you have landed into Cape Town International, you will realise that crime isn’t as large a topic as some people may think. Top tips are: don’t leave your car with valuables in, be careful in Cape Town after dark especially if you have had a few drinks, plus be sensible at night in Blouberg to. Also, ensure you keep your windows and doors locked when you are out of the house. Following these common-sense rules of thumb, it is unlikely that you will feel threatened in Blouberg. The Lions Head in the back ground! You never know who you might meet here! The ever popular Kite Beach! Head out to Stellanbosch to taste some wine! Penguins on the Cape Peninsula. The pro's like to come and hang out Nick Jacobsen is a regular visitor! Jo rides for North Kiteboarding and runs a Kitesurfing Coaching & Holidays business travelling around the world to various destinations running coaching trips wherever she goes. 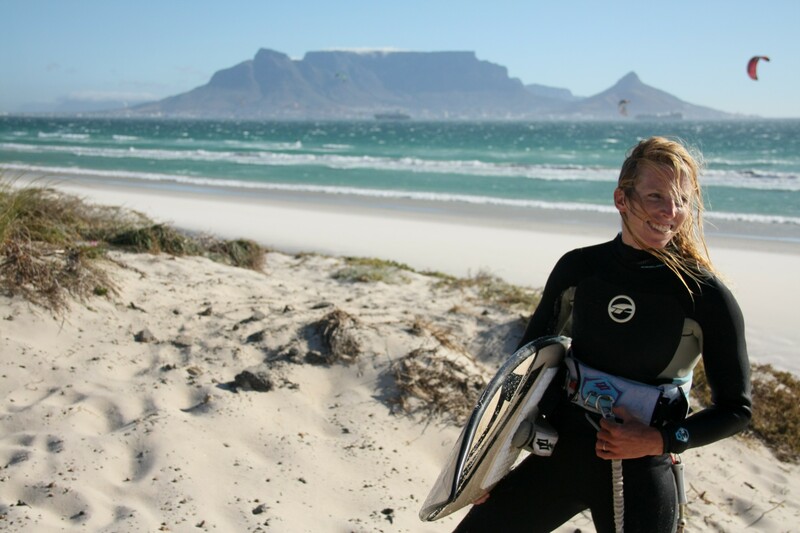 Her successful South African Adventure Holiday has been running since 2010 during January & February where Jo mixes up freestyle coaching in the flat water lagoon of Langebaan through to riding at the various spots of Blouberg. Been to Cape Town? What did you think? 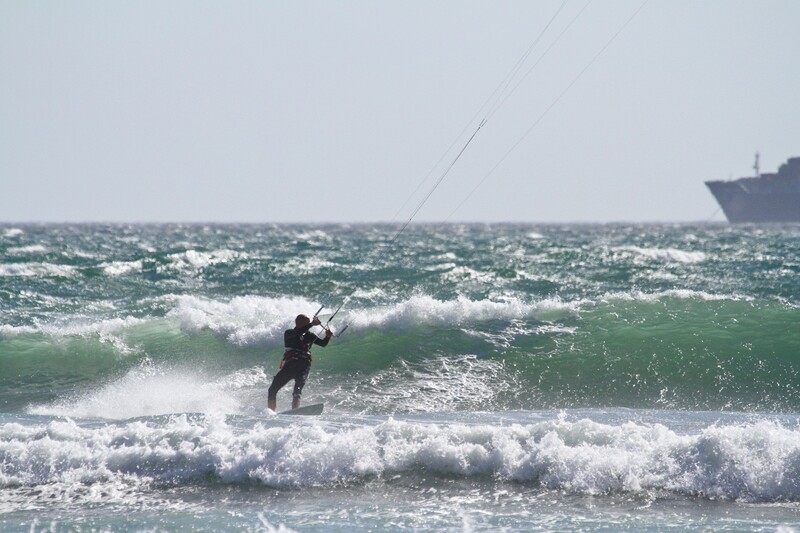 Where are the Best Kitesurfing Beaches in Cape Town? Best if the wind is forecasted SW or NW. Cross onshore providing flat water between good size kickers. The kickers roll in over a sandy base all the way to the shore. The wind usually builds here first in the mornings. 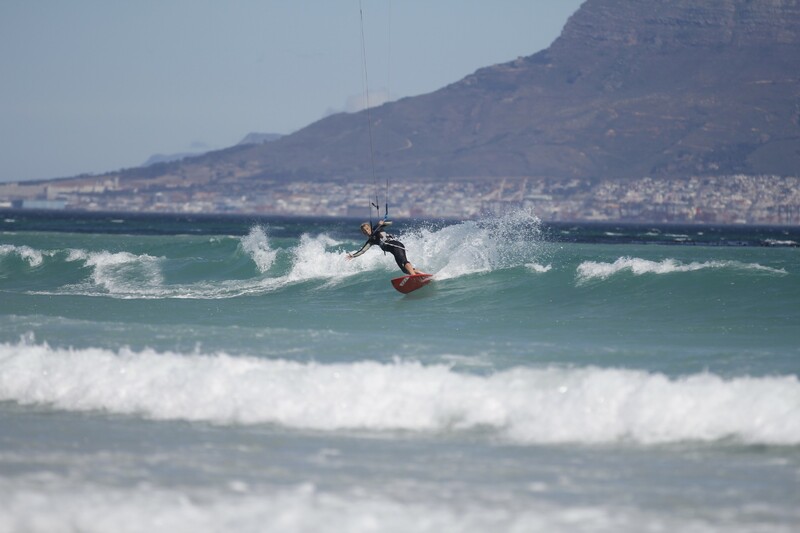 It often provides the cleanest / largest waves along the Blouberg coast. It’s probably the main windsurfing beach along this coastline although the windsurfers will not be here when the wind is quite light. The wind is often gusty on the inside, but it makes for some great down the line wave riding or start point for downwinders. Watch out the car park is probably the riskiest one along the strip so don’t leave anything on show inside the car while you are out on the water. This beach usually has the flattest water between the kickers especially when the tide is higher. It has a sandy base, clean wind and a beautiful sandy beach for launching and landing. The car park is manned, so feels like a good safe option for kiting. You will almost always find people here for some other kitesurfing company. The water can be a little more choppy here than at Dolphin Beach, but its often less busy then Dolphin while just as safe. The waves can be perfect here when a decent swell is running. The beach here is small and steep so there can be a decent shore dump to contend with, but there are great kickers and its often quite quiet if you are finding it too busy elsewhere. Doodles are the pub that overlooks it which does great pizzas and has an epic happy hour to drink half price ‘sundowners’ when you fall off the water. Its outside area means you can even come in straight off the beach and still in your wetsuit. Days to look out for are: Tuesdays and Thursdays from 6pm-8pm. 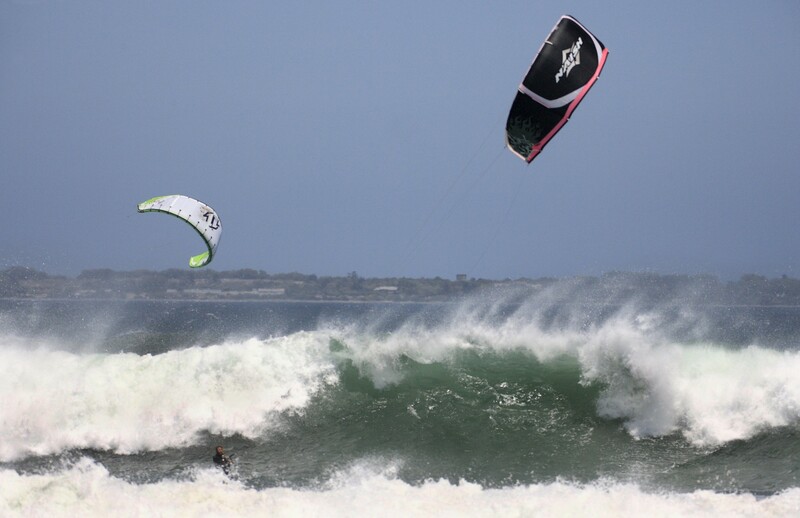 Big Bay is a popular kite spot with large flat sections between the waves, especially at high tide. It is backed by a large tourist complex called Eden on the Bay which is full of cafes, restaurants, kite shops and more. It has a very cosmopolitan feel when off the water and is a great place to hang out between sessions. Its great view and grassy area also make it a good family hang out for you to grab a quick hour or two while your other half and the kids watch on eagerly. Its also the beach that plays host to the annual RedBull King of the Air – kitesurfing’s most spectacular big air competition. Things to note are: the beach for launching and landing can be small, particularly at high tide and there are some rocks to watch out for downwind. The wind is less reliable the further you head away from table mountain, so when Sunset beach is blowing Big Bay can often be between 5-10 knots less making it an excellent choice for the afternoons. To access Calmers, you would launch as if you were going to ride at Big Bay. It’s the spot downwind of the Big Bay rocks. The waves often clean up nicely here and so it is often the place of choice for wave riders. Watch out this beach can get busy and many people either do not know the rights of way rules or do not care, so you will need to be prepared if it’s a busy day. There is almost one continuous beach as you travel further North from Calmers with a variety of spots to ride. There are also several car parks to base yourself from. These car parks overlook each spot and are obvious from the main road. The beaches are all usually considered to be wave riding beaches which have some rock slabs on the water's edge to watch out for. You can see these as soon as you step on the beach, but they are easily avoidable in your session. The further North you head from calmers the more deserted the beaches become so that you can be quite sure of a fairly quiet session. The waves on these beaches can often be bigger then the main kitesurfing spots mentioned, but you will need to check them out to see how the waves are breaking because it can be different depending on the day. 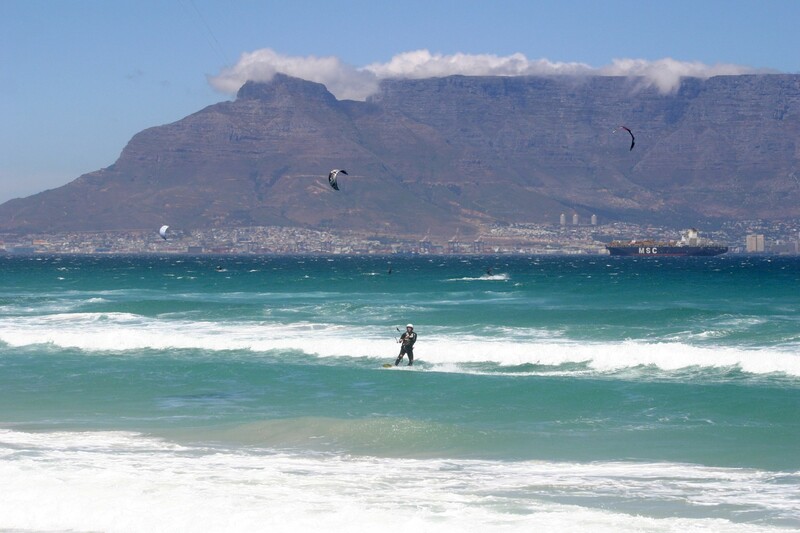 When is the Best Time to go Kitesurfing in Cape Town? Luke McGillewie is a ripper from South Africa who knows the area around Cape Town like the back of his hand. He gets our Ten Questions this issue! Go behind the scenes with Aaron Hadlow and filmmaker Laci Kobulsky as we investigate their new project, TWENTY, a full-length kiteboarding film. Get to know these two a little bit more and find out about possibly the biggest kite movie of the year by checking out the article! Rou Chater investigates the rising phenomena of kiting in stronger winds with bigger kites, the rising accidents and even deaths and looks at how we can protect ourselves and manage risk to stay safe. We head out to Cape Town to see what the fuss is about and why this is turning into the premier Euro destination during the winter months. We catch up with Vaughan Harris the creator of the new Cape Reels DVD showcasing some of the best spots in South Africa. The JN team take a look at South Africa with a guide to some of the less crowded spots at this world-class destination.